If Supersymmetry is found or excluded at the Large hadron Collider, how will it affect your opinion on string theory as unification of gravity and particle physics? This is a hard question and opinions differ widely across the range of theorists, but at the least any answer should be consistent with the laws of probability including Bayes Law. What can we really say? What does probability theory tell us about the range of possibilities that a theorist can consider for answers to this problem? Prior to the experimental result he will have some estimate for the probability that string theory is a correct theory of quantum gravity and for the probability that supersymmetry will be observed at the LHC. In my case I assign a probability of PST = 0.9 to the idea that string theory is correct and PSUSY = 0.7 to the probability that SUSY will be seen at the LHC. These are my prior probabilities based on my knowledge and reasoning. You can have different values for your estimates because you know different things, but you can’t argue with mine. There are no absolutely correct global values for these probabilities, they are a relative concept. You might try to tell me that there are other possibilities, such as that SUSY exists at higher energies or that string theory is somehow partly right, but I could define my conditions for correctness of string theory and for discovery of SUSY so that they are unambiguous. I will assume that has been done. This means that the four possible outcomes are mutually exclusive and exhaustive. We can conclude that P1 + P2 + P3 + P4 = 1. Of course the four probabilities must also be between 0 and 1. These conditions map out a three-dimensional tetrahedron in the four-dimensional space of the four probability variables with the four logical outcomes at each vertex. This is the tetrahedron of possible prior probabilities and any theorists prior assessment of the situation must be described by a single point within this tetrahedron. The condition that the two theories are independent fall on a surface given by the equation P1 . P4 = P2 . P3 that neatly divides the tetrahedron in two. Notice that I did not get to fix P1 separately from P3. If I know how much the discovery of SUSY is going to affect my confidence in string theory then I also know how much the non-discovery of SUSY will affect it. It is starting to sound like the string theory skeptic could be right, but wait. Let’s see what happens after the LHC has finished looking. Suppose SUSY is now discovered, how does this affect my confidence? My posterior probabilities P’2 and P’4 both become zero and by the rules of conditional probabilities P’ST = P1/PSUSY = 0.69/0.7 = 0.986. In other words my confidence in string theory will have jumped from 90% to 98.6%, quite a significant increase. But what happens if SUSY is found to be inaccessible to the LHC? In that case we end up with P’ST = P2/(1-PSUSY) = 0.21/0.3 = 0.7 . This means that my confidence in string theory will indeed be dented, but it is far from falsified. I should still consider string theory to have much better than level odds. So the skeptic is not right. The string theorist can argue that finding SUSY will be a good boost to string theory without it being falsified if SUSY is excluded, but the string theorists has to make a small concession too. His confidence in string theory has to be less if SUSY is not found. Remember, I am not claiming that these probabilities are universally correct. They represent my assessment and I am not a fully fledged string theorist. Someone who has studied it more deeply may have a higher prior confidence in which case excluding SUSY will not make much difference at all to him even if he believes SUSY would strongly imply string theory. According to an earlier commenter on this blog, today is the cut-off date for the LHC to collect data for the ICHEP conference. Despite technical issues, overall the LHC has been “enjoying remarkable availability” Right on cue the luminosity delivered has passed the 5/fb mark promised by the operations group. The total LHC delivered luminosity is now about 11.2/fb for CMS and will soon pass the 11.87/fb total for the Tevatron run II. Now the computer grid will light up as ATLAS and CMS push through the analysis for the Higgs and SUSY plots in time to get them approved for the massive ICHEP conference in one months time. 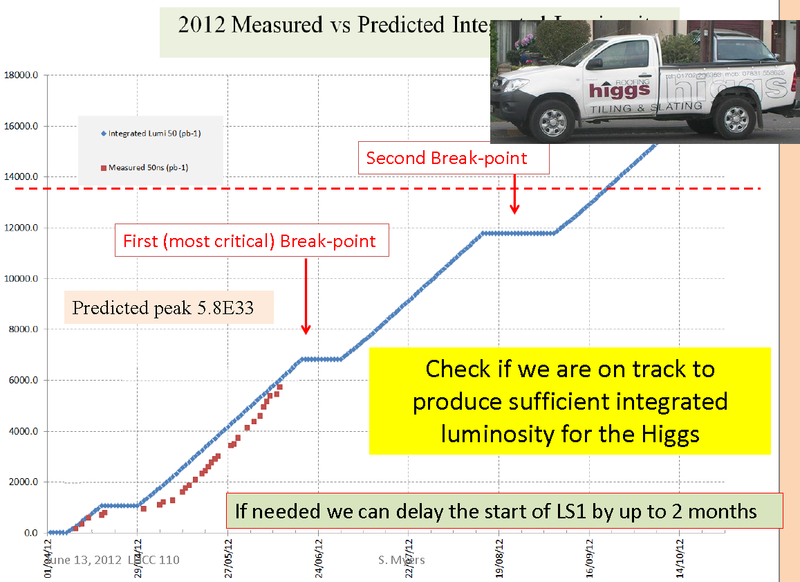 The schedule of talks shows that each experiment will be giving detailed talks for each individual Higgs channel (plus possibly a new H -> Z+γ analysis) using 2012 data at 8 TeV leading up to the final combinations for each experiment. They will leave it up to bloggers to complete the full combination. It is likely that they will fall just short of discovery significance in diphoton channels and combined plots for each experiment. 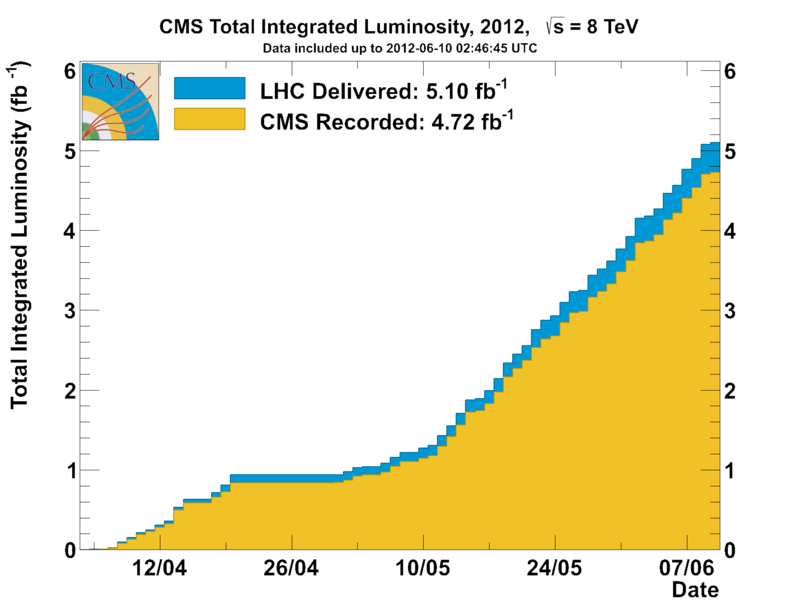 The full combined significance for the LHC will probably pass the 5 sigma finish line but no official combination will show that. This is not certain because the statistical fluctuations are not predictable. In the lead up to ICHEP there have been many lesser HEP conferences already but none have had data beyond 2011 available from the LHC. Even at this late stage ATLAS has added a new conference note with an update to the WW channel using multivariate analysis which improves the sensitivity from 2011 data. There have been a few interesting talks about the significance of the Higgs excess at 125 GeV and some comments about the fact that the diphoton channels are showing a stronger signal than expected while the WW channel is noticeably deficient. These irregularities are likely to be statistical but they are a sign of the interesting speculations that will follow further results. How much will the excesses seen in 2011 data be strengthened? Will the CMS and ATLAS peaks still be at slightly different masses? Will the channel branching ratios remain significantly different from standard model predictions? Will the 115GeV to 120 GeV window be excluded? Will the DG continue to call the observations just “interesting fluctuations” and get away with it? You are currently browsing the viXra log blog archives for June, 2012.